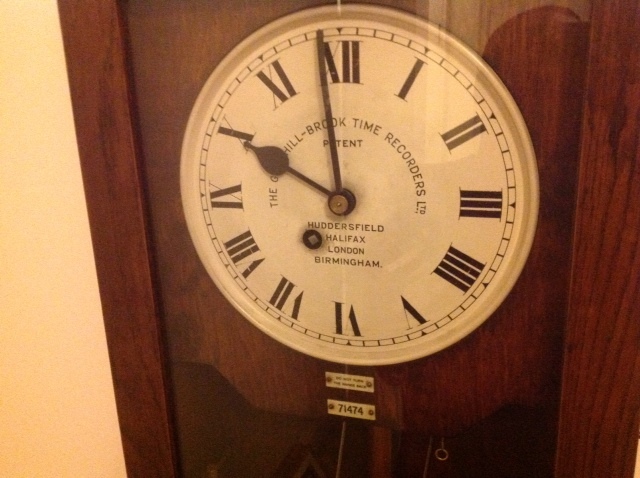 I have a Gledhill Brook Time Recorders grandfather clock. The label says 23883, but I checked on your website and it has no record of a clock with No.23883. Is it a fake? If not, where can I find more details about the clock - its year of manufacture etc? Gledhill Brook did not manufacture grandfather clocks. This may be what they refer to as a marriage. That would be the movement and face of a Gledhill put into a grandfather clock case. This would not be considered a fake. These sorts of marriages often happen with these older clocks. You still have a very high-quality timepiece because the movement is such high-quality. We would be very interested in seeing some photos if you have time to take them and send them. At the back of the garage I have come across the “clocking in/off” works of a Gledhill Brook time recorder which, from its number was made in 1929. I’ve attached some photos. Is this any good to anyone for spares/repairs? I don’t want anything for this item, but it would have to be collected, it weighs quite a lot! As shown in the photos, it is a bit rusty but looks all there. Location Lewes, East Sussex. Contact us at gledhillbrooktimerecorders@gmail.com if you are interested and we will forward your information onto David, the owner. We have the attached time recorder in our attic. The bottom section of the unit had been cut off so it's just the upper cabinet with clock face and pendulum serial number 50730. Can you tell me anything about this? I'm based on Dublin, Ireland. the extreme high quality if the movement, these are quite desirable. I have just bought a Gledhillbrook time recorder which appears to be in good working condition as a working curio. However the ribbon needs renewing and I have no time cards to use. Can you let me know is these are available? The serial number is 69477 and it is electric. We have purchased ribbons for our Gledhill Brook time recorders from ebay UK. However, if that’s not a feasible option for you, I would think an office supply store would be able to provide you with the carbon ribbon, provided you take a spool into them. As far as the time cards, these are much sought after item that many people are seeking, but no we have not yet heard of anyone locating them. We would be happy just to see an image of one so that replicas can be made, but as yet, we have not come across this. If we hear of anything, we will post it here. Hi Bill. We aren't as familiar with electrically propelled GB movements. The only thing we might suggest would be to take the mechanism out and see if there is a transformer of some sort that may indicate the voltage. Any of you GB fans out there have any other suggestions for Bill? Use the Comments feature below. We have one of these fine machines and want to use it as a clock in our home. It was used at a print works in Birmingham many moons ago and has great sentimental value. We know it has been serviced a few years ago but we are frightened to set the time and wind it up into operational use. Do you have any advice on how the set the time/winding? We have tried, but when we attempt to move the hands they don't seem to budge! Any ideas would be a great help. Thanks in advance. The hands on a time recorder are pretty heavy duty. They require more force because you are moving the movement and the punch mechanism. To set the time on these, you do move the hands, but a certain amount if force is necessary. It shouldn't matter whether the clock is wound or not, the hands should move. Could you tell me about this piece please? Has it any worth as am thinking of selling it? I apologize for the late response to your message. This is a desktop time recorder. Its value depends on where you'll sell it. They tend to be more valuable in America than in the UK. These are regularly for sale on eBay and eBayUK and I find that that is often the best way to gauge the current market price for one. I have seen the information about dating the clock from the number on the case itself. However is there any way of dating the movement, as this also has a number but is not the same as that on the case? Several examples on your web site show the oak case being very light oak finish, which I prefer (well my wife does!). My Gledhill Brook is finished with a very dark oak, more common I think, so how is the lighter oak finished obtained? On each side of my Gledhill wooden case there is a Gledhill Transfer/logo. It would be great to be able to get some new ones of these made up if the restoration warrants it. Finally what about suitable clocking in cards. Is there any format or template that could be made available so they could be scanned for example and these could be then made up by those who want them? Apologize for the very late response on this. We are not aware if any method to date the movement. That could just be our ignorance, however. They pretty much stayed the same over the years, so we can't even really date them by mechanical evolution. Regarding the case: I have a lighter oak case specimen, as well. I don't think they were manufactured in lighter oak, but when I restored mine, I stripped it, sanded it and stained it with a blond oak color. This is not in keeping with the original, but it does give it an attractive more contemporary look. The purists may frown upon that. But as with all things in this line, if you are going to keep these, it is often a matter of taste. I have not come across any transfer decals. Some clocks had GB on the side of the case, but I think these were painted on. The punch cards seem to be the holy grail with GB collectors. We've had many requests for samples or reproductions. I'm sure someone with graphic design software could create a template reproduction for us, but we have yet to see an example or image of an original to use as a guideline.